Well I’ve been home in rain drowned Brisbane for a touch over 24hrs now and I have the mozzie bites to prove it. I came home to a very impressive cocktail party that one of my housemate’s was hosting, the kitchen had been turned into a fully kitted out bar. The party was good and it was great to catch up with the assorted bunch of people who were there. I turned in to bed sometime round 3:30, I was so exhausted! The party of course kept on going and going till 9ish or so this morning. If I’m tired and need to sleep, I’ll go to sleep – doesn’t matter what is going on round me – perfect since my bedroom opens onto the kitchen and the deck. Which works pretty well in this house. I had a lovely and quiet breakfast this morning. 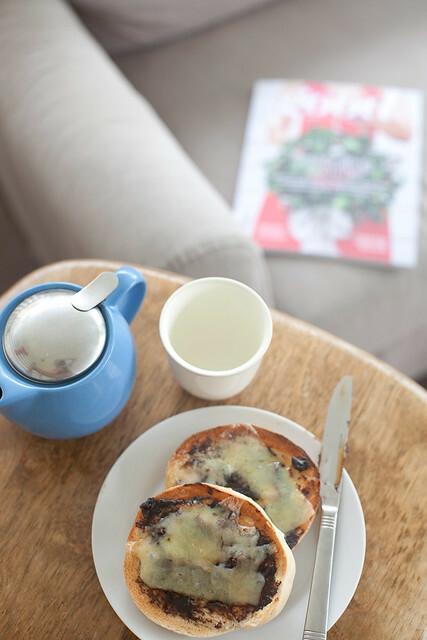 A cup of peach sencha tea, a vegemite and cheese toasted bagel and the most recent copy of Good. Even though we did have a lovely time in NZ, it is nice to be back in our own homes isn’t it?